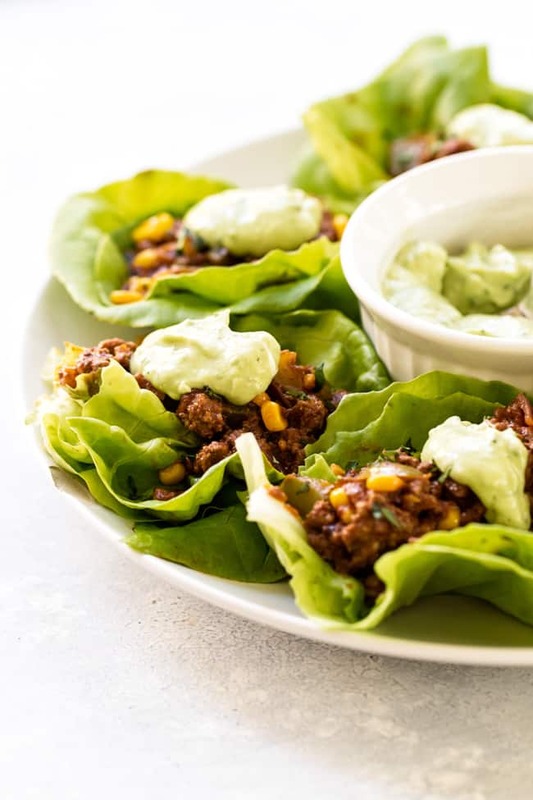 A savory taco-style filling made with beef and spicy chipotle peppers wrapped up in tender bibb lettuce and topped with a creamy avocado sauce. 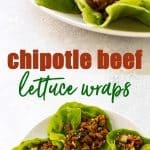 These chipotle beef lettuce wraps are how I like to do taco night without the tortillas. A few weeks ago, crazed with a taco craving and dangerously close to hitting up a drive-through, I pulled a few ingredients from the fridge that, together, would make a simple taco filling, but upon further fridge inspection realized I didn’t have any tortillas. I did have some leafy lettuce and, after a brief moment of convincing myself that I wouldn’t miss the tortillas ( <—carb loving’ girl, here, so it’s a tough sell sometimes) I turned what was supposed to be taco night into lettuce wrap night. 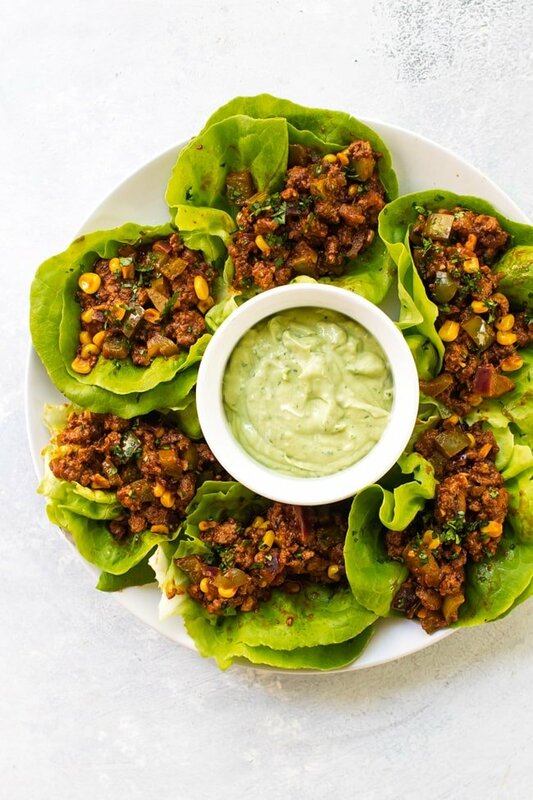 That first iteration, surprisingly satisfying and a reminder that it’s the savory taco filling that I most enjoy, led to a few more experiments until I landed on what I am sharing today – savory beef lettuce wraps made with spicy chipotle peppers, bell peppers, corn and wrapped up in tender bibb lettuce leaves with a dollop of creamy avocado sauce. They’re a little bit messy, full of smoky chipotle flavor, and evidence that I don’t always need tortillas when taco cravings hit, which, in my world, happens a lot more than I like to admit. The filling is pretty much a dump and stir operation that requires just one pan and takes about 15 minutes on the stovetop. 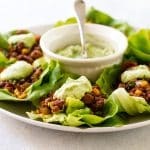 I like to load up my lettuce wraps with plenty of filling which makes them a whole lot messier, so be sure to double up the lettuce leaves or just cut back on the amount of filling for a less messy experience. I used ground beef, but I imagine ground turkey, pork and even chicken would work well, too. Green bell pepper (or use your favorite color!) and frozen corn. The avocado sauce combines some of my favorite taco toppings in one creamy sauce that not only is delicious on these beef lettuce wraps but also can stand alone as a great dip for chips. I used a mini food processor to make the sauce, but you can also do it by hand. Mash the avocado with a fork until it’s mostly smooth and then stir it together with the rest of the ingredients. The sauce might not be as smooth, but it will still be delicious. Savory chipotle beef wrapped up in tender bibb lettuce and topped with a creamy avocado sauce. Who says taco night needs tortillas? This recipe makes eight big (and a little messy) lettuce wraps – for a less messy experience just add some more lettuce and fill them with less of the chipotle beef. To make the filling, first heat the olive oil in a 10-inch pan over medium heat. Add the ground beef and cook it, breaking it apart with a spatula, until it’s no longer pink. Add the onion, garlic, and bell pepper and cook them with the beef for 2 to 3 minutes, or until they start to soften. Add the corn, chili powder, salt, chipotle pepper, adobo sauce, and tomato sauce. Stir and bring the filling to a simmer. Add the lime juice and reduce the heat to low while you make the sauce. 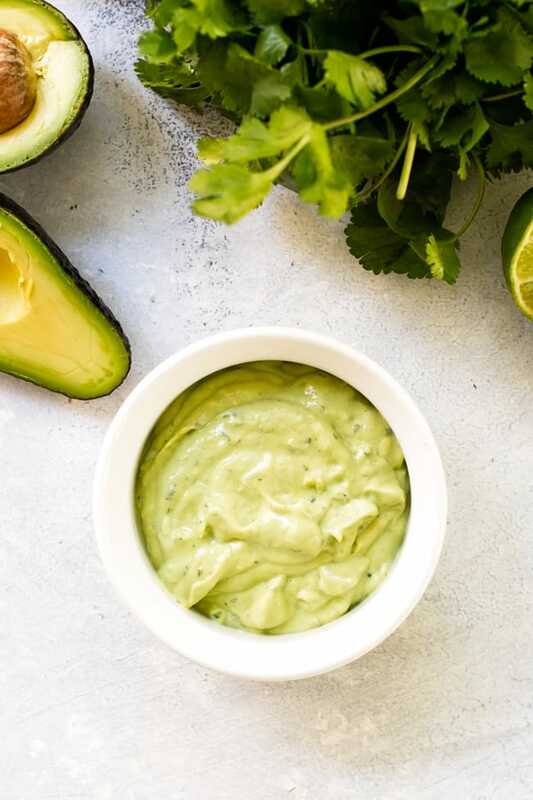 To make the sauce, place the avocado, lime juice, cilantro, sour cream, and kosher salt in a small food processor. Turn on the processor and, while it’s running, add the olive oil until the sauce is combined. To make the wraps, place the filling on top of two lettuce leaves. Top each wrap with a dollop of the avocado sauce and garnish with chopped cilantro. I love how creamy the olive oil makes the sauce, but you can omit it to save on some calories. The sauce will have more of a guacamole-like consistency. I used a small food processor, but you can make the sauce without it. First, mash the avocado until it’s somewhat smooth. Add the rest of the ingredients and just stir until combined. I haven’t tried making the sauce in a standard-sized blender and, because of the small amount, can’t say how that might work. When I try using my blender for small amounts it doesn’t always work right, so be aware. And because sometimes we need things really simple, a dollop of plain sour cream or store-bought guacamole in place of the avocado sauce is delicious, too.